St. Sophia Cathedral in ancient Polotsk is a unique temple among the few eponymous Orthodox shrines of Europe, one of the earliest in Ancient Rus and the first stone in the territory of Belarus. This ancient monument is on the UNESCO World Heritage List. 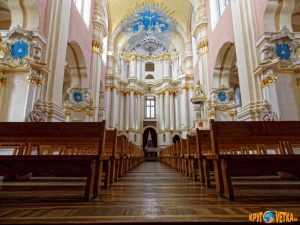 The Sophia Cathedral of the Wisdom of God with a truly special and symbolic architecture was built in Polotsk on the right bank of the Western Dvina in the 11th century. In the middle of the XVIII it was thoroughly reconstructed according to the design of architect Jan Glaubitz in the style of Vilnius (late Belarusian) baroque. However, to this day from the temple of the XI century fragments of masonry, almost completely preserved ancient foundation, parts of the apse, pillars and walls, as well as amazing fresco paintings of the second half of the 11th century, came to the temple. The cathedral today is striking in its beauty and grandeur. 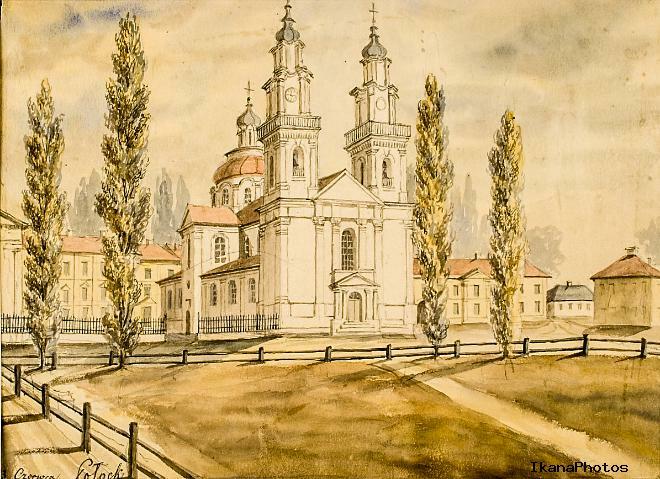 It is interesting that an exact copy of the Sophia Cathedral of the 11th century is planned to be built on the bank of the Western Dvina, but in another famous city of Belarus – Vitebsk. 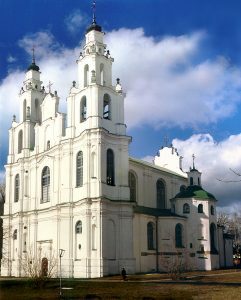 The stone cathedral in Polotsk appeared after its “older sisters” in Kiev and Novgorod, built on the model of the cathedral in Constantinople, and became the fourth in the world temple of St. Sophia. The Greek word “sophia”, meaning “wisdom, skill”, the inhabitants of Polotsk explained more broadly – as a great human community, the manifestation of the unity of the inhabitants of the principality. 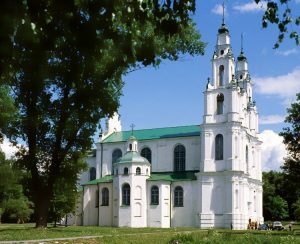 For the first time the temple is mentioned in the “Life of the Monk Euphrosyne of Polotsk” and “The Lay of Igor’s Host” of the 12th century. The majestic building was erected by Byzantine masters and townspeople in 1044 – 1066 years by order of Prince Vseslav Charodey. The symbol of independence and power of the Polotsk principality, the temple as if personified a white ship floating along the Dvina. Built according to Byzantine canons, but in the traditions of Polotsk architecture, the temple was located in the Upper Castle between the prince’s mansion and the bishop’s manor, which spoke of the role of the church in the state. Polotsk Sophia became an Orthodox and cultural and educational center. Here there were a rich library, an archive, a treasury, a magistrate, religious relics were kept and receptions of ambassadors were arranged. In the cathedral there was also a princely burial vault, where archaeologists discovered 16 sarcophagi. In 1596, after the conclusion of the Brest church union, the church was transferred to the Uniate Church and restored after the fires of 1607 and 1648. In the course of the rebuilding, by order of Archbishop Josaphat Kuntsevich, the tops of the corner battle towers of the temple-fortress were removed. During the Northern War, by order of Peter I, the cathedral was used as a warehouse for ammunition, and after the explosion in 1710 it was significantly destroyed. 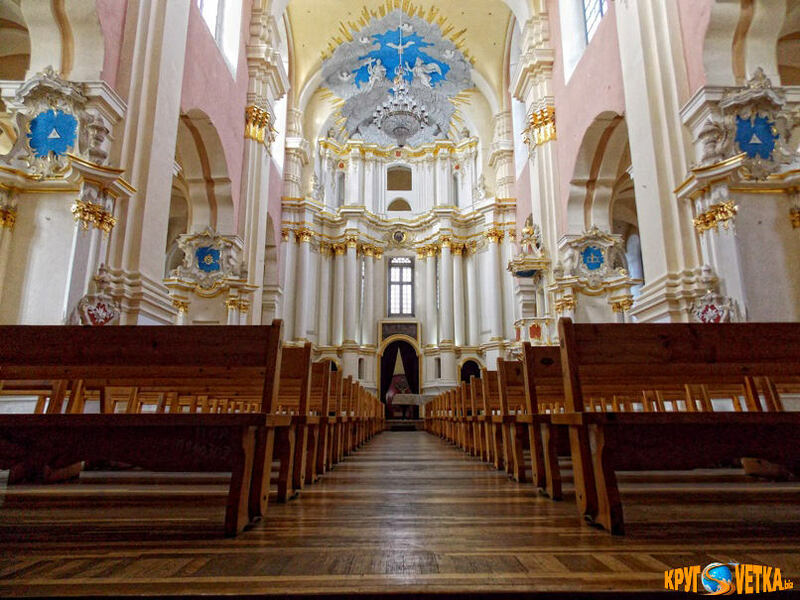 In the XVIII century, thanks to the Polotsk archbishop Florian Gribnitsky, the famous architect Jan Krishtof Glaubitz rebuilt the St. Sophia Cathedral in the style of the Vilno baroque. During the war of 1812 in the wall of the cathedral in a specially made niche the sacred orthodox relic – the Cross of Euphrosyne of Polotsk was kept. Architecture of St. Sophia Cathedral. the seven-domed church, which symbolized seven Ecumenical church councils (the Kiev Sophia had 13 chapters, Novgorod’s – 5). In the XI century Polotsk Sophia became a grandiose structure – 26.4 m wide, 31.5 m long and 31 m high, with walls 2.3 m thick. In the construction, plinth and rough stones-boulders were used. A picturesque drawing on the walls created a masonry in the technique of a “drowned” series. 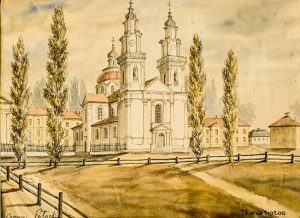 The cathedral in Polotsk received a modern look in the 18th century: according to Yana Glaubitz’s plan on the banks of the Dvina, a majestic one-apse basilica appeared with two tower-bell towers, deployed by a facade towards the river. The luxurious interior was supplemented by baroque columns, stucco moldings and curved cornices. On the altar vault appeared bas-relief image of the Trinity New Testament and the second and first tiers decorated with wooden sculpture and painting. Up to now, the old frescoes are partially preserved, including images of the Savior Not Made by Hands and a copy of Leonardo da Vinci’s famous work The Last Supper. A large restoration of the cathedral was held in the 70-80 years of the twentieth century. And in 2010-2013 during the reconstruction of the temple, the roof, facade and window openings were renewed. At present, St. Sophia Cathedral is one of the largest cultural centers of Belarus. Here, services and ceremonies are performed, excursions, concerts and creative evenings are held. St. Sophia Cathedral as a museum of the history of architecture and a concert hall is part of the National Polotsk Historical and Cultural Museum-Reserve. The Museum of the History of Architecture of St. Sophia Cathedral was opened in 1987. His exposition presents rare exhibits, telling about the history of the temple, the peculiarities of architecture and its last restoration. Among them – fragments of the masonry of the XI century, the foundation and fresco paintings of the late XI century. 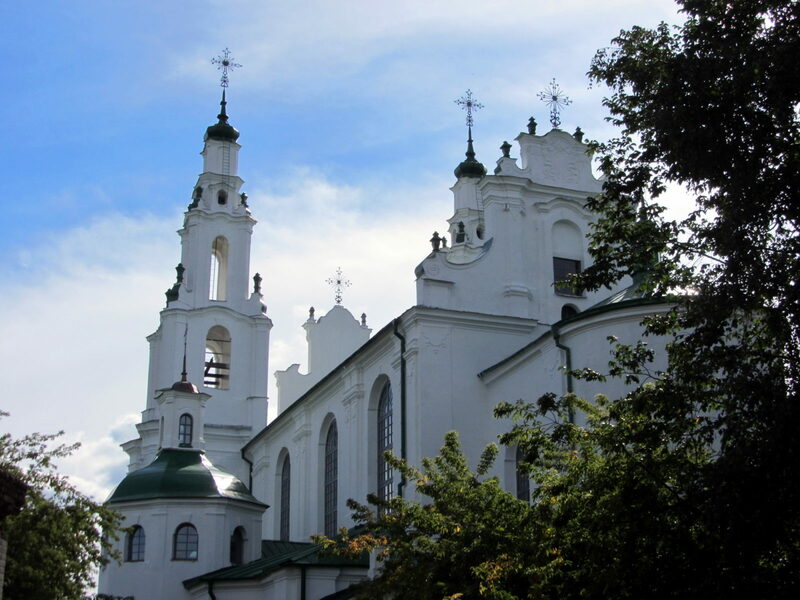 For an independent visit to the museum, an audio guide has been developed in Belarusian, Russian and English, as well as a guidebook with a cathedral plan and a Polotsk map. In 1983, for the first time the audience gathered a concert hall in St. Sophia Cathedral, which is famous for its excellent acoustics, and since 1985 the organ sounds here. International Festival of Organ Music “Zvani Safi” (November-December). Every Sunday at 15.00 for tourists and admirers of classics there are concerts of organ music (in the year there are more than 300).